Problem: NVMExpress Macs that have Refind do not see the APFS container and I cannot boot into my mac. Also, apologies to those who were aware of this solution, but I faced this issue along with several other technicians on the problem and we could not solve this until now. A NVMExpress controller. Examples of Macs that do have it are the Mac Models 18,2, and 18,3. 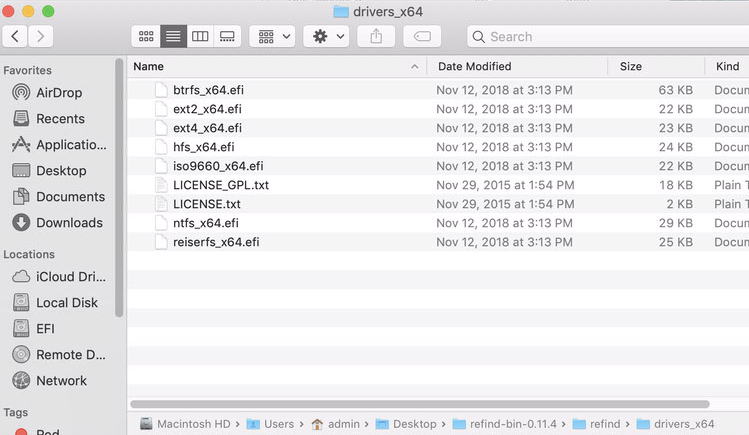 If you install refind using the unix installer onto an NVMExpress machine, it does not automatically install the appropriate driver folder that will allow you to support APFS, leaving you to assume that refind is buggy. 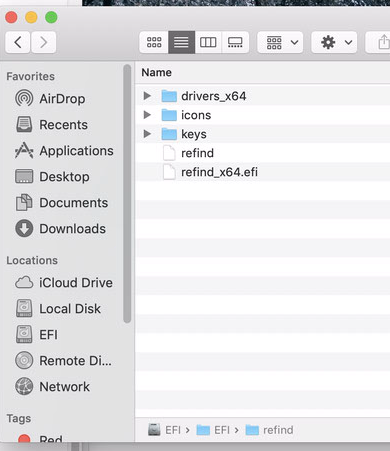 Refind ends up not being able to see the APFS container Preboot or Macintosh HD volumes on the refind menu to boot into your Mac OS Mojave System. If you tried this on a non NVMExpress machine and had High Sierra APFS, you would only see the Macintosh HD volume, which validates that refind works. This is also true if you had Mojave on a non NVMexpress machine, as refind version 11 would easily pick up on both the Preboot and the Macintosh HD Volumes. EDIT: Thank you to @DavidAnderson for pointing out that the driver file "hfs_x64.efi" is what causes the Mac to be able to see the bootable container on the mac. Please see his answer for a better explanation. The solution is very brief and involves installing the "driver_x64" folder included with the refind download in refind-bin_X/refind/drivers_x64. Below are some useful commands that helped me. system_profiler SPHardwareDataType | grep "Model Identifier:"
Newer macs will most likely have the NVMExpress SSD Controller. But if you are curious in learning what kind of connection you are using, you can input the following commands, separately. If your device is SATA it will return the info regarding your SATA hard drive and the connection. If your device is NVMExpress then it will return info regarding your NVMExpress Hard drive and the connection. Of course if your device is not NVMexpress then it will return nothing. Please note that the version of Refind will affect which Volumes you would be able to boot up from. I tested this on Refind version 10.4 and 11.4. From my testing I found that with 10.4 you will only be able to see the "Macintosh HD" volume. I hope this helps! This was breaking my head for over a week until this simple solution occurred to me. Hopefully it helps you as well. 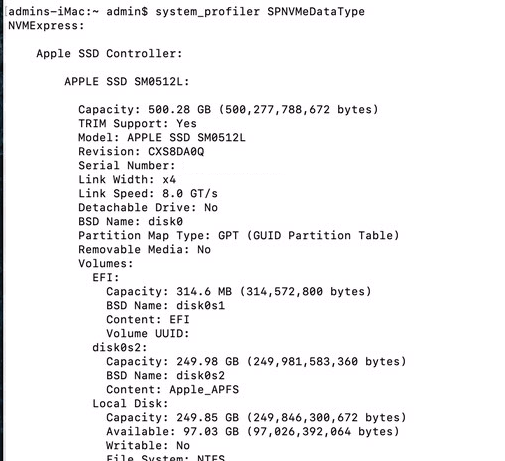 Normally, rEFInd relies on the Mac firmware to read Apple formatted partitions. Eventually, this software is not sufficient in certain circumstances. You can include all the drivers provided with rEFInd by adding the --alldrivers option when executing the ./refind-install script. However the refind-install man page states the following with regard to this option. When you specify this option, refind-install copies all the driver files for your architecture. You may want to remove unused driver files after you use this option. Note that some computers hang or fail to work with any drivers if you use this option, so use it with caution. I assume one of the drivers you want to keep would be named hfs_x64.efi. The The rEFInd Boot Manager: Using EFI Drivers webpage states the following about this driver. HFS+—Oracle wrote this driver, apparently with some code taken from open source Apple examples. It was then further modified by the Clover authors. I expect this driver to have limited appeal to most rEFInd users. Macs don't need it, since Apple's EFI implementation provides its own HFS+ driver, and HFS+ isn't normally used on UEFI-based PCs. Some CDs are mastered with both ISO-9660 and HFS+, or even with HFS+ alone, and it's conceivable that an HFS+ driver would be useful when accessing such discs. Also, one unusual feature of this driver is that it can read files from within an Apple LVM setup, which Apple's own EFI HFS+ driver can't do. The upshot of this feature is that if you load this driver on a Mac that uses Apple's LVM, rEFInd is likely to show two OS X boot options. Ordinarily this is pointless, but it could be helpful if your Recovery HD volume becomes damaged. I'm providing the driver mainly because it compiled cleanly with no extra work, aside from providing a Makefile entry for it. APFS is Apples latest attempt to create a LVM. The above excerpt does confirm that the driver can detect additional boot options when using Apple's LVM. Not the answer you're looking for? Browse other questions tagged high-sierra mojave dual-boot apfs refind . How can I remove straying Preboot folders in /Volumes?